A report in (1) The Telegraph informs how the Daughters of Charity of St. Vincent de Paul, which managed the Smyllum Park orphanage in Lanarkshire, acknowledged previously that the bodies of 158 children were buried in the nearby St. Mary’s cemetery. Though many believed this figure as inaccurate and the real number was much higher. According to an investigation by (2) BBC News in collaboration with the Sunday Post newspaper, there could be more than 400 children buried in a mass grave at the site. The Smyllum Park Orphanage opened in 1894. It provided residence for children from broken homes and orphans. The orphanage finally closed in 1981. During its operation, the orphanage had been the home of 11,600 children. In 2003, two former residents of Smyllum Park Orphanage uncovered the bodies of a number of children in a burial plot at the cemetery. As part of an attempt to cover up the truth about the abuse many of the former residents of the orphanage had been subjected to, Jim Kane and Frank Docherty had come across an unmarked plot, which was overgrown. In 2004, the Daughters of Charity told Kane and Docherty that the records they held on the deaths of children at the cemetery suggested there were children buried in 158 compartments across the graveyard. The nuns had, however, admitted the records may be incomplete and Jim Kane and Frank Docherty, who both died this year, believed the numbers were far higher. The BBC and Sunday Post investigation involved sifting through more than 15,000 official records from the orphanage. The investigation confirmed a total of 402 babies, toddlers and children had died at the orphanage between 1864 and 1981, much more than the Daughters of Charity had made out. The study also revealed that the majority of the children who had deceased at the orphanage had been buried in a mass, unmarked grave at St. Mary’s cemetery. Headstones are present in the graveyard of the nuns and members of staff who had died at the cemetery and had been buried at the site, but the children who had lost their lives didn’t have any kind of memorial or place where their names were recorded. Most of the child deaths at the orphanage occurred between 1870 and 1961. An evaluation of the records shows that most of the deaths were children aged five or under. Very few of the youngsters who lost their lives at the Lanark institution were over the age of 15. Very little was recorded about the children living at the orphanage, other than their name, date of birth and when they died. The causes of death included accidents and diseases like scarlet fever, flu and tuberculosis. Malnutrition was another cause of death. Francis McColl is believed to be buried at the site. McColl died in 1961 when he was just 13. His death certificate states a brain hemorrhage took his life. Francis’ brother Eddie has always wondered what happened to his brother. He had heard Eddie had been hit on the head by a golf club, which would correspond with the cause of death on his death certificate. However, Eddie has been unable to find any trace of where his brother had been buried. The allegations of abuse that took place at the orphanage include violence and beatings, psychological abuse and public humiliations. These allegations became part of a campaign which was the inspiration behind the (3) Scottish Child Abuse Inquiry. Representatives of the Daughters of Charity said they are “co-operating fully” with the Child Abuse Inquiry. 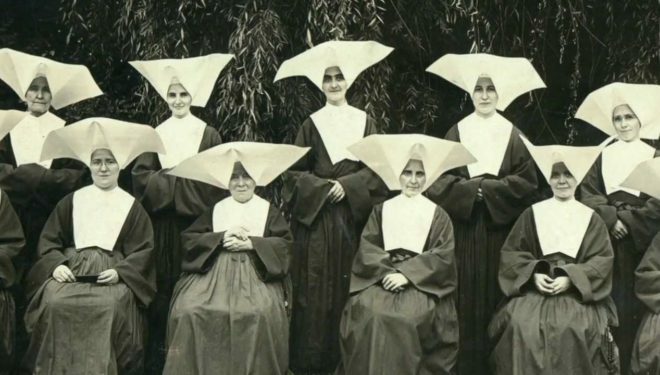 The nuns refused to respond to questions from reporters about how many children were buried in the mass grave. The harrowing Smyllum Park orphanage scandal is the latest in a long line of (4) shocking and controversial inquiries relating to the abuse of children in the UK.